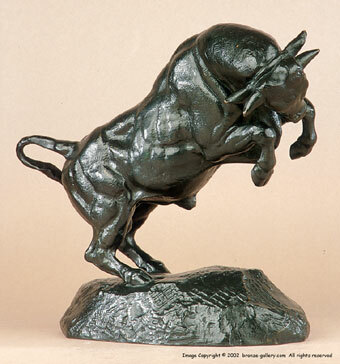 Barye originally sculpted the Rearing Bull in 1841 but he did not cast it in bronze until 1845. The Bull is shown in the instant he rears up on his hind legs but his heavy bulk will bring him back to earth very quickly. This model was also adapted into Barye's Bull Attacked by a Tiger by adding a Tiger to the base that is reaching up and grabbing the powerful Bull as he rears in an effort to trample the predator under him. Bulls have been a popular subject in art for centuries as a symbol of power and masculinity. 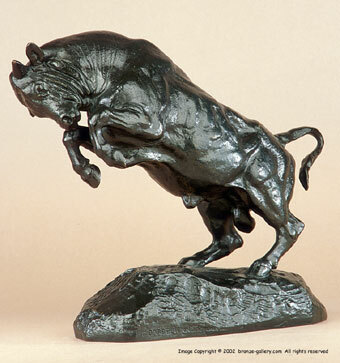 Barye sculpted several fine models of Bulls during his long career and the Rearing Bull is one of his best. He shows the heavy beast in action and captures the Bull's character perfectly. This impressive bronze was cast by Ferdinand Barbedienne and is finished in a rich dark brown patina.